We hope everyone had a nice Memorial Day Weekend. Patrick got some extra sleep while Charlotte and I enjoyed spending the weekend at my parents' house. 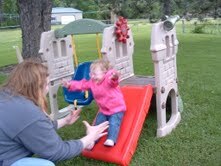 Grandma and Grandpa surprised Charlotte with a perfectly-sized play structure. She liked this swing very much because it was close enough to the ground that she was able to hop out whenever she wanted. And definitely preferred being caught at the bottom. She enjoyed helping grandma cook. We visited Red Wing with my uncle Lyle and acted like tourists with one of the famous (?) Red Wing boots. Uncle Lyle introduced Charlotte to one of his kittens, and Charlotte was very interested in petting it. We also learned how much fun jumping on mom is. Charlotte has been saying Daddy with increasing regularity, but in reference to me (Katie). Hopefully we can help her figure out whose who in the near future. Charlotte has her new lens! Her right lens is significantly thicker than her left lens, but it's hardly noticeable with the thick infant frames. We decided not to invest in prescription sunglasses in anticipation that her prescription will change again in August. Charlotte is not a fan of this decision, and we've resorted to hiding her sunglasses so she doesn't get upset that she can't wear them anymore. Now that we're in Minnesota Charlotte was evaluated by the state's birth to three program. We posted about the evaluation results a while back and while everything was pretty positive she qualifies for services because of her prematurity. We've agreed to have an occupational therapist visit us in-home twice/month, and are pleased that she is able to come after 5 p.m. so that Charlotte can benefit from her services and we don't have to miss work. She's only come once so far and it sound like she'll try to help us with feeding and also focus on Charlotte's gross motor skills. This means fun trips to the park and practicing stairs, which Charlotte has gotten quite good at. We haven't made much progress with feeding. We switched to the more elemental formula, Peptamin Jr., a couple of weeks ago and have seen little change. In fact, the first few days she was on the new formula her vomiting increased. She vomited twice overnight (instead of once in the morning) and also at lunch time - prompting daycare to express displeasure over the switch. Things seem to have leveled out to where we were at with the Pediasure. She still vomits and has trouble sleeping, but Dr. Erickson said it could take up to 6 weeks to see improvement. Stay tuned. We've been having mashed potatoes pretty regularly. She also tried some BBQ sauce at a restaurant this weekend and seemed to like it. She's turning out to be quite the homestyle girl. Charlotte hasn't been swimming yet, but she loves trying on her swim suits. I'm not sure she'll ever wear this two piece outside of the house because its a bit too easy for her to pull on her G-tube, but she enjoyed playing in it. Thanks to my cousin Karen for the hand-me-downs! She's very interested in socks and shoes and loves to help us put hers on each morning. Before we know it she'll be dressing herself! ...but get me out of this swing! Since our last post Charlotte has developed a cough and increased vomiting (possibly related). We've resumed her nebulizer treatments to hopefully help her sleep more soundly, and next week we'll start the new formula. Last week we had a follow-up appointment with her pediatrician to make sure her ear infections cleared up. She still has a bit of fluid behind her ear drum, but the doctor doesn't think it's causing her any pain. We'll be back in August for Charlotte's 2-year (yes, TWO YEAR!) well-baby visit and hopefully they'll be all cleared up by then. We've had very little success brushing Charlotte's teeth, and her pediatrician recommended toddler toothpaste which I didn't even know existed. We bought some, it smells like candy, and now Charlotte kind of likes chewing on her tooth brush. Every once in a while I'm able to do some brushing, but we rely primarily on wash cloth chewing to clean her teeth. The pediatrician showed us a WWF-style hold that we can try, but I'm hesitant because every time we force it she vomits...a lot. Good news! Charlotte loves mashed potatoes and gravy. She eats about a tablespoon in a sitting. It's fantastic. And for our latest stress! Charlotte had her eyes examined yesterday and her left eye has stayed pretty stable from a -4.25 refraction to a -5.00 refraction. Her right eye, however, has changed from -4.25 to -13.50. We learned that this is not uncommon in kids who had as severe of Retinopathy of Prematurity (ROP) as Charlotte did. The ophthalmologist says this happens because the human brain is lazy (efficient) and is going to take the easiest way out. It starts to rely on the good eye and stops using the weaker eye, which decreases the vision in the weak eye. Step 1 is to get a new lens, so Charlotte and I visited Grand Spectacle last night to order her new lens. Step 2 is to return to the ophthalmologist in 3 months to find out what's next. It seems likely that Charlotte will need to wear a patch for a few years to force her brain to use her weak eye. I have a hard time grasping what this means for her vision long-term, so I asked her new ophthalmologist to what degree I should be concerned. She said it was difficult to quantify...really any response other than - "don't worry at all!" makes me worry. She did give us a good website to review: http://www.aapos.org/terms_faqs. She said Charlotte COULD develop Amblyopia and MAY develop Strabismus. What in the world is the difference between could and may in this context?